It is an age old question when it comes to renovation of the home. Which tiles are better? Which ones are cheaper? Should you opt for the price and versatility of ceramic tiles, or the durability, quality and visual appearance of the porcelain tiles? We break down the key differences, so you can make an informative decision. When it comes to durability, it is hard to beat the porcelain. Due to the composition of the porcelain tile and the process of manufacture, the porcelain tile is more durable, and it is better suited for heavy usage when compared to the ceramic tile. Just for experiment, take one porcelain and one ceramic tile. Chip the porcelain one, and you’ll notice that the color keeps going. On the other hand, if you chip the ceramic tiles, the color changes underneath the top glaze. As for the production process, even though both the porcelain and the ceramic tile are fired, porcelain tiles are fired at a higher temperature and for a longer period. Porcelain tiles also have higher feldspar content that further contributes to their durability. Porcelain as a material has a 0.5% water absorption rate. The process of manufacturing porcelain tiles goes like this: the fired porcelain tile is weighed, then boiled for additional five hours, then it is left in water for 24 hours, and then weighted again. If the second time the tile is measured the weight is less than the 0.5%, the tile is considered porcelain. As for the density, porcelain is way denser than ceramic, which makes the tile harder. Also, porcelain tiles are more impervious to moisture when compared to ceramic tiles. Porcelain tiles are available in limited colors, and their palette includes white, grey, or cream. 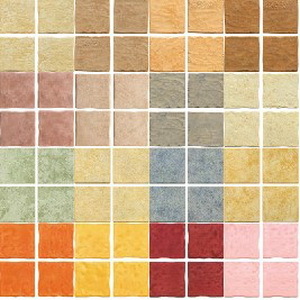 For ceramic tiles, on the other hand, you can choose from a variety of colors. When it comes to flexibility, ceramic tiles are the better option, as you can mix different colors. The color of the ceramic tiles depends on the type of clay that has been used for production. When it comes to visual appearance, it is hard to ignore the beauty of porcelain tiles. They are thinner, which results in more delicate appearance, and their surface is smooth, even when they are not glazed. Porcelain tiles are made out of pasty clay, and the fineness of the clay allows the manufacturer to intricate fine details. Ceramic tiles, on the other hand, have sturdy appearance, and rarely feature fine details. If they are not glazed, the surface has grainy texture. If all other factors are equal, ceramic tiles are way cheaper than porcelain ones. For those who consider the price only, in general, ceramic tiles are 50% cheaper than the porcelain tiles. However, you need to consider other factors as well. The general rule of thumb is that ceramic tiles are forbidden for outside usage. Ceramic tiles absorb too much water, which results in damage of the tiles. Porcelain tiles, on the other hand, can be used outside, but with certain safety measures. Nothing can help the ceramic tile survive on the outside. In recent years, there have been porcelain tiles that are specifically designed for exterior use. If all things are equal, the best way is to choose the tiles that fit your lifestyle and home. However, keep in mind that your tiles need to stand the test of time, for both practicality and fashion trend. Our advice is to stick to porcelain tiles when tiling the kitchen or a conservatory. Due to their better durability, porcelain tiles are the better option when you have young children and pets. For the bathroom you can choose ceramic tiles.